Coastal cities vanish under the encroaching sea, storms and wildfires wreak havoc on land, food shortages cause widespread famine and starvation, and plants and animals die off in droves. This is the kind of world we may be forced to accept if we don’t eliminate global greenhouse gas emissions by the end of the century, according to the United Nations Intergovernmental Panel on Climate Change (IPCC). That’s the conclusion of the IPCC’s fourth and final instalment in the climate reports that together make up its Fifth Assessment — a compilation and analysis of the latest scientific knowledge on climate change. Three other reports have come out since September 2013, all containing dire warnings about the planet’s future if humans don’t make a concerted effort to reduce their carbon emissions and slow the progress of global warming. 1. Humans are causing climate change, and our influence is only growing. 2. We have to act fast if we want to avoid the worst consequences of climate change. 3. We have the means to limit climate change, if we act now. The report includes a summary of the observed and projected consequences of climate change, including melting ice, sea level rise, more intense storms, declining crop yields, ocean acidification, and a loss of biodiversity, and it reiterates humans’ role in these effects. 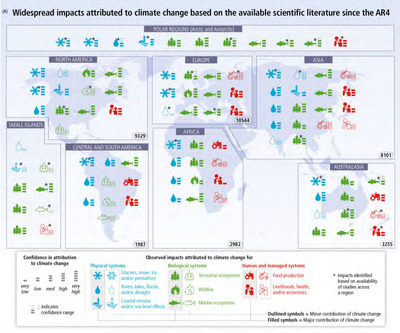 This chart from the report shows the widespread impacts of climate change that are already being observed around the world. 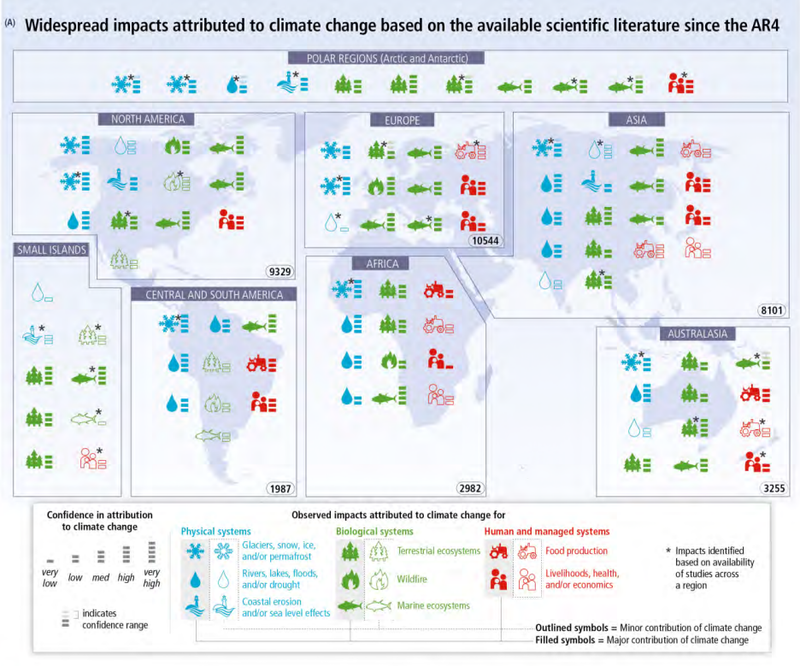 The key at the bottom explains what each symbol means and how confident scientists are that the effect is caused by climate change (one bar equals very low confidence and five bars equals very high confidence). For example, scientists have high confidence that climate change is causing snow and ice to melt in North America. Another big takeaway from the report: Climate change will disproportionately affect developing countries and those already afflicted by poverty — the people least responsible for creating the problem in the first place. Most urgently, the report proposes a 40% to 70% reduction in greenhouse gas emissions by mid-century and a total elimination of emissions by 2100. UN Secretary General Ban reiterated that such action does not have to be at odds with economic prosperity. In fact, he argued, “economic growth and climate action can be mutually reinforcing.” Now, all that’s necessary is for world leaders to play along, which has been a big sticking point — even our own government has hidden climate data and downplayed its impacts in the past. The next UN Climate Change Conference will be held in Lima, Peru in December. But Ban has directed more attention to 2015’s conference in Paris, where attending nations are expected to develop a new, binding agreement on climate action. With the science out and the recommendations in, global action — or inaction — on climate change could direct the future of the planet and all its inhabitants.